Persecuted by Robin Parrish was an enthralling read. I am not usually into political thrillers, but this one is so plausible that I was drawn in from the first page and couldn't put it down until the very end. There are so many pieces of this book that are familiar as things happening in current news media. But the way Robin Parrish weaves the details together totally blew my mind. He makes reality and fiction combine into a powerful story where corruption is ruling the day and nobody realizes it. John Luther could be any one of us. We've all done things that we regret, things we wish we wouldn't have done. His past may be filled with deeper regrets like drugs and alcohol, but I could empathize with wanting to leave some things from your past in the past. When he is framed for murder and has to go on the run, I'm amazed at how well he is able to do so. From that moment onward, I was compelled to keep reading. 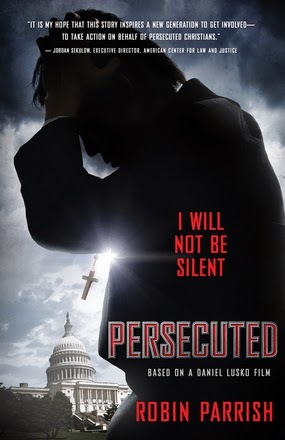 And now, the film of "Persecuted" has opened in theaters. I'm looking forward to seeing it live on the big screen. About the book:The Question Is Not IF Attempts Will Be Made to Limit Religious Freedoms, But WhenJohn Luther, simply wants to share the Gospel and enjoy a quiet life with his family. He never asked to be at the center of a political controversy, but an ill wind has been blowing through the halls of Congress, and supporters of a new religious-equality bill see Luther's endorsement as critical. When Luther refuses to lend his support, he unknowingly sets in motion an explosive plan bent on destroying his reputation and undermining everything for which he stands. His once-normal life is turned upside down as he becomes a fugitive left with only one dangerous option--putting everything he holds most dear at risk while he fights to expose the truth. It is a mission that brings him face-to-face with the coming storm of persecution that could threaten the very fabric of our nation's freedoms. Enter to win a copy of the book Persecuted below. Winner must respond in 48 hours to claim prize. One entrant per mailing address, per giveaway. If you have won this same prize on another blog, you are not eligible to win it again. Winner subject to eligibility verification.